I was not involved in that decision (which was made by the FTP masters team), but since there is some confusion around it, I will try to give my understanding of the resulting issues. deb http://deb.debian.org/debian jessie main is the easy one. It contains the bulk of packages. It is initialized by copying the content of the testing suite when a new stable release happens, approximately every two years. It is then updated from stable-new (an internal suite) when stable point releases happen (see below). deb http://security.debian.org/debian-security jessie/updates main is the security suite in the figure above. It is used by the Debian security team to provide security updates. They are announced on the debian-security-announce mailing list. deb http://ftp.debian.org/debian jessie-updates main (stable-updates above) is a suite used to distribute important updates that are unrelated to security, and that cannot wait the next stable point release. They are announced on the debian-stable-announce mailing list. Interestingly, a large proportion of those updates are related to changes to daylight-saving-time rules that are sometimes made very late by some countries. stable point releases happen every few months (see for example the Debian 8.11 stable point release). They consist in updating the stable suite by copying important updates that were submitted to stable-proposed-updates. Security updates are also included. backports follow an entirely different path. They are new versions of packages, based on the version currently in the testing suite. See the backports team website. architectures and packages covered by the Long Term Support project. In other words: jessie and jessie-updates won’t receive any update. The only updates will be through the security suite, by the Debian Long Term Support project. At about the same time (I think – I could not find an announcement — Update: announcement), the maintenance of backports for jessie was also stopped. Which makes sense, because the backports team provides backports for the current release, and stretch was released in June 2017. The FTP masters team decided to remove the jessie-updates and jessie-backports suite from the mirrors. This was announced on debian-devel-announce, resulting in the errors quoted above. For the jessie-updates suite, you can simply remove it from your /etc/apt/sources.list. It is useless, because all packages that were in jessie-updates were merged into jessie when Debian 8.11 was released. E: Release file for http://archive.debian.org/debian/dists/jessie-backports/InRelease is expired (invalid since 36d 1h 9min 51s). Updates for this repository will not be applied. After that, apt-get update just works. Add classification tags to lintian for relevant stuff (maybe starting with being able to regenerate the graphs from 2015). The help of someone with Perl knowledge, willing to modify lintian to add additional classification tags. There’s no need to be a Debian Developer, and lintian has an extensive test suite, that should make it quite fun to hack on. The code could either be integrated in lintian, or live in a lintian fork that would only be used to generate this data. Ideally (but that’s less important at this stage), the help of someone with web skills to generate a nice website. Michael Stapelberg writes about his frustrations with Debian, resulting in him reducing his involvement in the project. That’s sad: over the years, Michael has made a lot of great contributions to Debian, addressing hard problems in interesting, disruptive ways. Most of Michael’s points are about the need for modernization of Debian’s infrastructure and workflows, and I agree that it’s sad that we have made little progress in that area over the last decade. And I think that it’s important to realize that providing alternatives to developers have a cost, and that when a large proportion of developers or packages have switched to doing something (using git, using dh, not using 1.0-based patch systems such as dpatch, …), there are huge advantages with standardizing and pushing this on everybody. There are a few reasons why this is harder than it sounds, though. First, there’s Debian culture of stability and technical excellence. “Above all, do not harm” could also apply to the mindset of many Debian Developers. On one hand, that’s great, because this focus on not breaking things probably contributes a lot to our ability to produce something that works as well as Debian. But on the other hand, it means that we often seek solutions that limit short-term damage or disruption, but are far from optimal on the long term. There’s also the fact that Debian is very large, very diverse, and hard to test. It’s very easy to break things silently in Debian, because many of our packages are niche packages, or don’t have proper test suites (because not everything can be easily tested automatically). I don’t see how the workflows for large-scale changes that Michael describes could work in Debian without first getting much better at detecting regressions. We could use Gitlab merge requests to track patches, rather than attachments in the BTS. Some tooling to provide an overview of open MRs in various dashboards is probably needed (and unfortunately GitLab’s API is very slow when dealing with large number of projects). I would love to see a team experiment with a monorepo approach (instead of the “one git repo per package + mr to track them all” approach). For teams with lots of small packages there are probably a lot of things to win with such an organization. Local queueing of emails, so that I can write emails when offline, queue them, and send them later when I’m online. Routing of emails through several remote SMTP servers, ideally depending on the From header, so that emails pass SPF/DKIM checks. I currently use nullmailer, which does queueing just fine, but cannot apparently handle several remote SMTP servers. There’s also msmtp, which can handle several “accounts” (remote SMTPs). But apparently not when using queueing using msmtpq. What are you using yourself? systemd services, and queue management? I’ve been increasingly using systemd timers as a replacement for cron jobs. The fact that you get free logging is great, and also the fact that you don’t have to care about multiple instances running simultaneously. I’d like to trigger a full run of the service unit: if the service is not running, it should be started immediately. If it’s currently running, it should be started again when it terminates. Same as the above, but with queue coalescing: If I do the above multiple times in a row, I only want the guarantee that there’s one full run of the service after the last time I triggered it (typical scenario: each run processes all pending events, so there’s no point in running multiple times). Is this doable with systemd? If not, how do people do that outside of systemd? Implementing “right to disconnect” by delaying outgoing email? France passed a law about “right to disconnect” (more info here or here). The idea of not sending professional emails when people are not supposed to read them in order to protect their private lifes, is a pretty good one, especially when hierarchy is involved. However, I tend to do email at random times, and I would rather continue doing that, but just delay the actual sending of the email to the appropriate time (e.g., when I do email in the evening, it would actually be sent the following morning at 9am). I wonder how I could make this fit into my email workflow. I write email using mutt on my laptop, then push it locally to nullmailer, that then relays it, over an SSH tunnel, to a remote server (running Exim4). Of course the fallback solution would be to use mutt’s postponing feature. Or to draft the email in a text editor. But that’s not really nice, because it requires going back to the email at the appropriate time. I would like a solution where I would write the email, add a header (or maybe manually add a Date: header — in all cases that header should reflect the time the mail was sent, not the time it was written), send the email, and have nullmailer or the remote server queue it until the appropriate time is reached (e.g., delaying while “current_time < Date header in email”). I don’t want to do that for all emails: e.g. personal emails can go out immediately. Any ideas on how to implement that? I’m attached to mutt and relaying using SSH, but not attached to nullmailer or exim4. Ideally the delaying would happen on my remote server, so that my laptop doesn’t need to be online at the appropriate time. Update: mutt does not allow to set the Date: field manually (if you enable the edit_headers option and edit it manually, its value gets overwritten). I did not find the relevant code yet, but that behaviour is mentioned in that bug. There’s a pattern that comes up from time to time in the release management of free software projects. To allow for big, disruptive changes, a new development branch is created. Most of the developers’ focus moves to the development branch. However at the same time, the users’ focus stays on the stable branch. 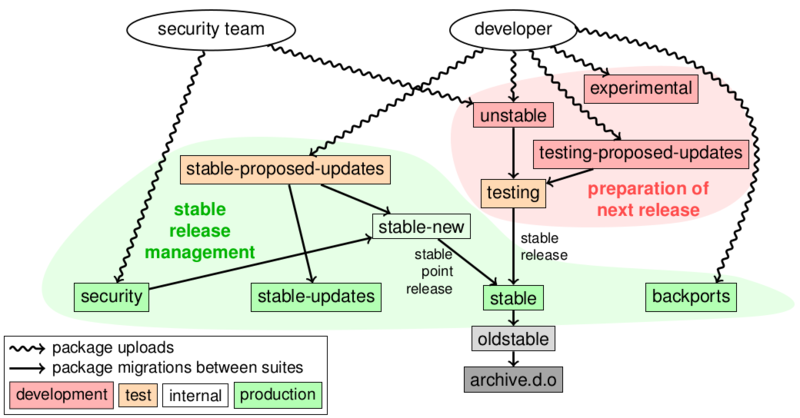 The development branch lacks user testing, and tends to make slower progress towards stabilization. Since users continue to use the stable branch, it is tempting for developers to spend time backporting new features to the stable branch instead of improving the development branch to get it stable. This situation can grow up to a quasi-deadlock, with people questioning whether it was a good idea to do such a massive fork in the first place, and if it is a good idea to even spend time switching to the new branch. To make things more unclear, the development branch is often declared “stable” by its developers, before most of the libraries or applications have been ported to it. This has happened at least three times. Before the 2.6 series, there was a stable branch (2.4) where only relatively minor and safe changes were merged, and an unstable branch (2.5), where bigger changes and cleanups were allowed. Both of these branches had been maintained by the same set of people, led by Torvalds. This meant that users would always have a well-tested 2.4 version with the latest security and bug fixes to use, though they would have to wait for the features which went into the 2.5 branch. The downside of this was that the “stable” kernel ended up so far behind that it no longer supported recent hardware and lacked needed features. In the late 2.5 kernel series, some maintainers elected to try backporting of their changes to the stable kernel series, which resulted in bugs being introduced into the 2.4 kernel series. The 2.5 branch was then eventually declared stable and renamed to 2.6. But instead of opening an unstable 2.7 branch, the kernel developers decided to continue putting major changes into the 2.6 branch, which would then be released at a pace faster than 2.4.x but slower than 2.5.x. This had the desirable effect of making new features more quickly available and getting more testing of the new code, which was added in smaller batches and easier to test. Then, in the Ruby community. In 2007, Ruby 1.8.6 was the stable version of Ruby. Ruby 1.9.0 was released on 2007-12-26, without being declared stable, as a snapshot from Ruby’s trunk branch, and most of the development’s attention moved to 1.9.x. On 2009-01-31, Ruby 1.9.1 was the first release of the 1.9 branch to be declared stable. But at the same time, the disruptive changes introduced in Ruby 1.9 made users stay with Ruby 1.8, as many libraries (gems) remained incompatible with Ruby 1.9.x. Debian provided packages for both branches of Ruby in Squeeze (2011) but only changed the default to 1.9 in 2012 (in a stable release with Wheezy – 2013). Finally, in the Python community. Similarly to what happened with Ruby 1.9, Python 3.0 was released in December 2008. 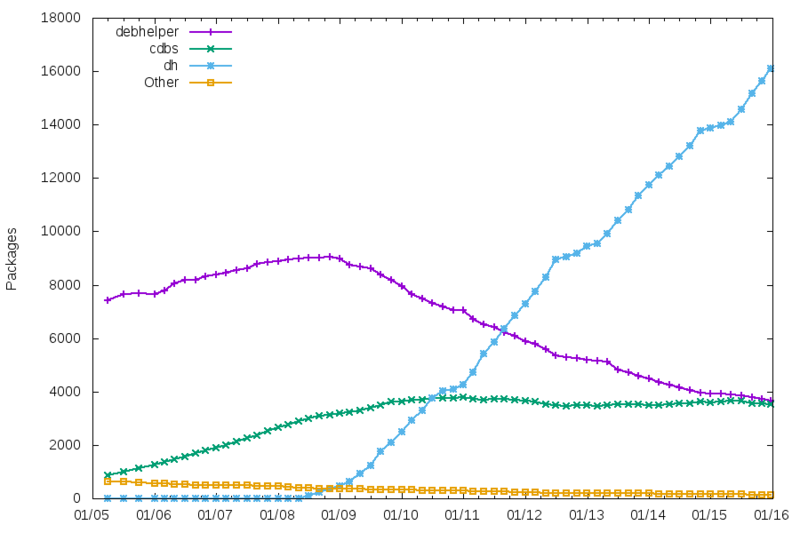 Releases from the 3.x branch have been shipped in Debian Squeeze (3.1), Wheezy (3.2), Jessie (3.4). But the ‘python’ command still points to 2.7 (I don’t think that there are plans to make it point to 3.x, making python 3.x essentially a different language), and there are talks about really getting rid of Python 2.7 in Buster (Stretch+1, Jessie+2). In retrospect, and looking at what those projects have been doing in recent years, it is probably a better idea to break early, break often, and fix a constant stream of breakages, on a regular basis, even if that means temporarily exposing breakage to users, and spending more time seeking strategies to limit the damage caused by introducing breakage. What also changed since the time those branches were introduced is the increased popularity of automated testing and continuous integration, which makes it easier to measure breakage caused by disruptive changes. Distributions are in a good position to help here, by being able to provide early feedback to upstream projects about potentially disruptive changes. And distributions also have good motivations to help here, because it is usually not a great solution to ship two incompatible branches of the same project. Russell Coker wrote about Sysadmin Skills and University Degrees. I couldn’t agree more that a major deficiency in Computer Science degrees is the lack of sysadmin training. It seems like most sysadmins learned most of what they know from experience. It’s very hard to recruit young engineers (freshly out of university) for sysadmin jobs, and the job interviews are often a bit depressing. Sysadmins jobs are also not very popular with this public, probably because university curriculums fail to emphasize what’s exciting about those jobs. However, I think I disagree rather deeply with Russell’s detailed analysis. First, Version Control. Well, I think that it’s pretty well covered in university curriculums nowadays. From my point of view, teaching CS in UniversitÃ© de Lorraine (France), mostly in Licence Professionnelle Administration de SystÃ¨mes, RÃ©seaux et Applications Ã base de Logiciels Libres (warning: french), a BSc degree focusing on Linux systems administration, it’s not usual to see student projects with a mandatory use of Git. And it doesn’t seem to be a major problem for students (which always surprises me). However, I wouldn’t rate Version Control as the most important thing that is required for a sysadmin. Similarly Dependencies and Backups are things that should be covered, but probably not as first class citizens. I think that there are several pillars in the typical sysadmin knowledge. First and foremost, sysadmins need a good understanding of the inner workings of an operating system. I sometimes feel that many Operating Systems Design courses are a bit too much focused on the “Design” side of things. Yes, it’s useful to understand the low-level mechanisms, and be able to (mentally) recreate an OS from scratch. But it’s also interesting to know how real systems are actually built, and what are the trade-off involved. I very much enjoyed reading Branden Gregg’s Systems Performance: Enterprise and the Cloud because each chapter starts with a great overview of how things are in the real world, with a very good level of detail. Also, addressing OS design from the point of view of performance could be a way to turn those courses into something more attractive for students: many people like to measure, benchmark, optimize things, and it’s quite easy to demonstrate how different designs, or different configurations, make a big difference in terms of performance in the context of OS design. It’s possible to be a sysadmin and ignore, say, the existence of the VFS, but there’s a large class of problems that you will never be able to solve. It can be a good trade-off for a curriculum (e.g. at the BSc level) to decide to ignore most of the low-level stuff, but it’s important to be aware of it. Students also need to learn how to design a proper infrastructure (that meets requirements in terms of scalability, availability, security, and maybe elasticity). Yes, backups are important. But monitoring is, too. As well as high availability. In order to scale, it’s important to be able to automatize stuff. Russell writes that Sysadmins need some programming skills, but thatâ€™s mostly scripting and basic debugging. Well, when you design an infrastructure, or when you use configuration management tools such as Puppet, in some sense, you are programming, and in terms of needs to abstract things, it’s actually similar to doing object-oriented programming, with similar choices (should I use that off-the-shelf puppet module, or re-develop my own? How should everything fit together?). Also, when debugging, it’s often useful to be able to dig into code, understand what the developer was trying to do, and if the expected behavior actually matches what you are seeing. It often results in spending a lot of time to create a one-line fix, and it requires very advanced programming skills. Again, it’s possible to be a sysadmin with only limited software development knowledge, but there’s a large class of things that you are unlikely to address properly. I think that what makes sysadmins jobs both very interesting and very challenging is that they require a very wide range of knowledge. There’s often the ability to learn about new stuff (much more than in software development jobs). Of course, the difficult question is where to draw the line. What is the sysadmin knowledge that every CS graduate should have, even in curriculums not targeting sysadmin jobs? What is the sysadmin knowledge for a sysadmin BSc degree? for a sysadmin MSc degree?